Like fun and food with friends? Then you’ll love SMORGASBOARD®, the fun new game for foodies! Whether you’re looking for a way to spice up your dinner parties or for the ideal gift for that food lover in your life, SMORGASBOARD® is the perfect game for foodies, friends and family alike. Players take on the guise of aspiring chefs as they work their way around the board in search of gastronomic success. The object of the game is to be the first team of chefs to graduate from Rick’s Culinary Academy! The losers... do the dishes! Created by husband and wife entrepreneurs, Richard Kelly & Maggie Leonard, the game is manufactured by Hasbro Ireland in Waterford, and proudly carries the guaranteed Irish logo. Born from a passion for food and a love of design, the pair has spent the last two years developing SMORGASBOARD®, which features artwork by multi-award winning illustrator, Steve Simpson. To enter to win a copy of SMORGASBOARD®! Leave a comment on this post telling us your what recipe you excel at making! One lucky winner will be randomly select by Monday 3/18 at 12pm PT. Those who want a bite of the SMORGASBOARD® go to Smorgasboard.ie for a list of stockists or to purchase online. The page email isn't working. Says to contact administrator. I make a fantastic vegetarian version of Cincinnati-style chili with finely chopped mushrooms and caramelized onions. I make a dish called STEAK DENISE..just a twist on the name..but it is how I got my husband when he came into the restaurant where I worked! Congratulations Denise! Our random number generator has selected you as our lucky winner! 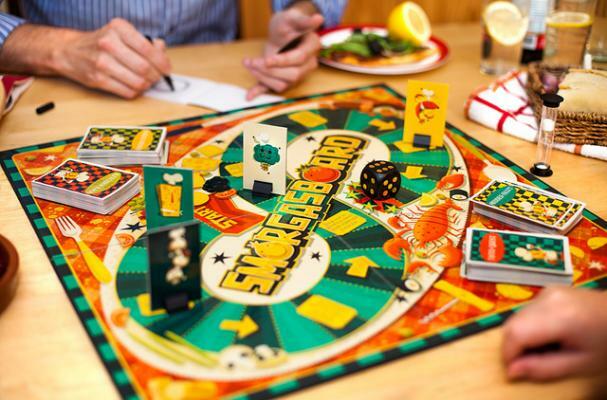 Please email me your shipping address at sheri@foodista.com and we'll get your SMORGASBOARD game shipped out to you!